Organic grocery sales are surging, but Kroger is grabbing more of those gains than Whole Foods. Whole Foods (NASDAQ: WFM) is "the leading retailer of natural and organic foods, the first national 'Certified Organic' grocer, and uniquely positioned as America's Healthiest Grocery Store," according to its annual report. These seem like three fantastic competitive advantages to have as shoppers shift their grocery spending away from products like sodas and processed foods and into healthier options. The organic food category is surging by double-digits -- far outpacing the 3% growth of the U.S. supermarket industry. But Whole Foods isn't capturing most of those gains right now. Instead, the grocer's comparable-store sales growth fell from 4.5% at the end of 2014 to 3.6% in the first quarter of this year. Taking a broader view, Whole Foods' comps haven't hit 5% since the fourth quarter of 2013. Comparable-store sales growth. Source: Company financial filings. Kroger (NYSE: KR), on the other hand, has booked three straight quarters of over 5% comps gains, stretching its growth by that metric into its 12th consecutive year. Its management credits the organic food sector with powering the hefty recent sales gains. "We continue to see outstanding, double-digit sales growth in our natural foods department," a Kroger executive told investors in the first-quarter conference call. Kroger's success at snatching organic and natural food shoppers from rivals comes down to lower prices. Rather than take advantage of the price premium between these products and the nonorganic choices, Kroger instead has been driving prices for organic products down to the point that there's little or no markup over their nonorganic counterparts. Here's how Chief Operating Officer Mike Ellis described the strategy in a recent conference call with investors: "Our customers don't want to have to pay a premium for natural and organics. And we're trying to make sure that they can get a good quality product at a price that's comparable to the nonorganic brands and in some cases actually the same price." The bad news for Whole Foods is that there isn't much it can do to neutralize this challenge. Its supermarkets have a high cost profile, thanks to being stuffed with luxuries including sit-down eateries, wood-burning pizza ovens, and wine bars. That's by design. Part of the company's larger mission, it says, is to "transform food shopping" from a chore into "a more dynamic experience." Because it sells more than just stuff, Whole Foods earns twice the profit margin of no-frills grocery competitors such as Kroger and Costco. 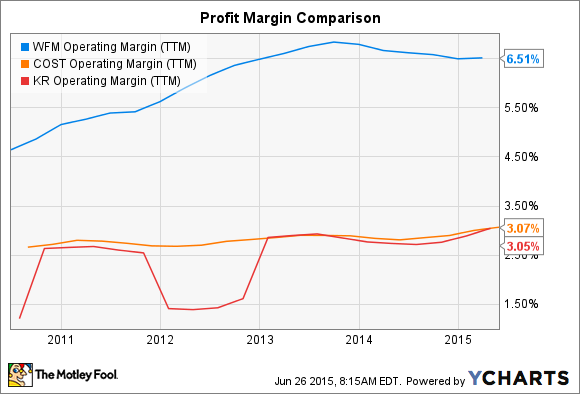 WFM Operating Margin (TTM) data by YCharts. However, a drawback of that approach is that Whole Foods can't net a profit at the same tiny product margins that these companies can. The good news for Whole Foods is that organic foods are taking over the supermarket aisles, and that means the market should expand dramatically in the next few years. The category made up less than $100 billion of the $600 billion supermarket industry in 2013, leaving plenty of room to grow. Whole Foods just can't attack that opportunity with its traditional, high-cost store layout, which is why the company plans to introduce a smaller, cheaper store profile. Meanwhile, management still sees huge potential for the traditional Whole Foods experience. The company's goal remains to eventually operate 1,200 supermarkets across the country, or about three times the current store footprint. As they expand, the battle against Kroger and lower prices for organics will only heat up.